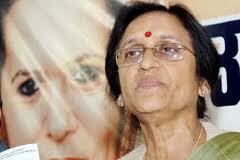 Rita Bahuguna Joshi today resign from Uttar Pradesh(UP) Congress president post after she met Congress President Sonia Gandhi. After meeting Gandhi for the first time after the poll results, Joshi told reporters that she has owned the responsibility for the defeat and offered to step down. Uttar Pradesh Congress Committee (UPCC) president took responsibility for the defeat as Congress finished a distant fourth, gaining only a few seats more than in 2007 polls and far below the expectations. Joshi said there were several reasons behind the poor showing and leaders should not indulge in blame game. She, however, made a direct attack on Sultanpur MP Sanjay Singh, who had said Gandhi's dream in the state was sabotaged by non-cooperative local leaders. Even in Amethi and Rae Bareli, the pocketboroughs of Gandhi family, the results were a shocker to the party as it managed to win only two of the ten assembly seats. The Parliamentary seats are represented by Rahul Gandhi and Sonia Gandhi.